If you visited the Makerhood website over the weekend, you may have noticed that we have a new-look home page! Many thanks to developer Andy Broomfield for all the work he’s put in on this over the past few weeks. We had really good feedback on the look of our original site, so we didn’t want to change the feel drastically. But because we’ve got so many other activities going on, we wanted the home page to showcase more of what we do. So we’ve got a greater range of goods on display, some of which will be chosen by guest curators as their favourites. At the moment we’ve highlighted items with a Christmas theme, but if you have any ideas for someone who lives or works in the area covered by Makerhood who would like to choose their favourite items on the site, let us know. 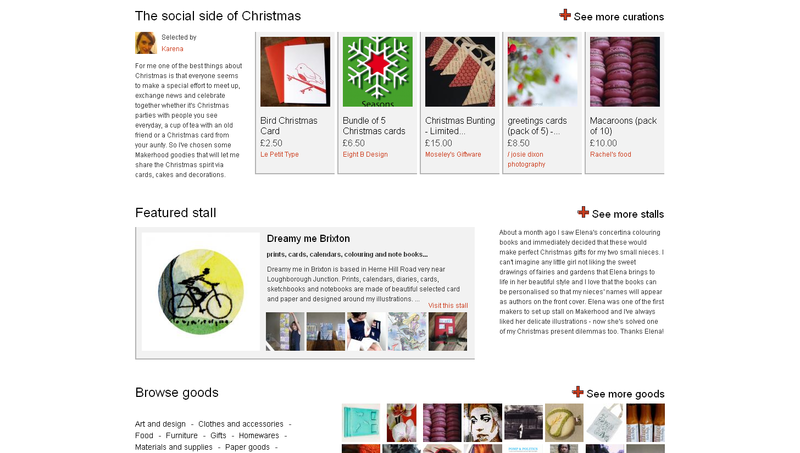 We’ve retained a featured stall and featured workshops, but we’ve also got more social features. So you can see the latest items on the blog as well as photos of some of the Makerhood community – our friendly Makerhoodies! And of course you can still see the latest forum discussions, advertised workshops and goods for sale, as well as keep up with our activities on Twitter, Facebook and Flickr. We hope you like the new home page – do let us have your feedback so we can continue to improve the site for everyone!